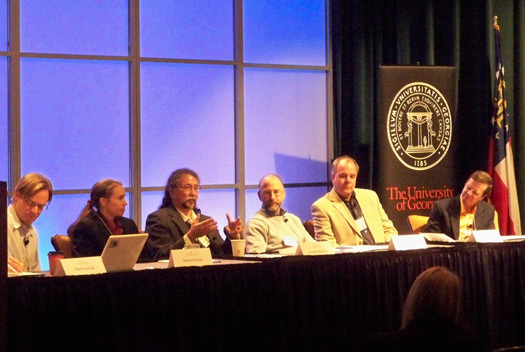 On Wednesday, January 26, 2011, UGA – Georgia Sea Grant hosted a unique Symposium on the Gulf Oil Spill called Building Bridges in Crisis. The goal was to bring together members of the Scientific community, Government, Media, BP, and representatives from local sectors impacted in an effort to openly discuss the oil spill response and how the aforementioned groups can work together more effectively in times of crisis. There was certainly a good amount of debate and frank discussion, which was clearly needed in order to make progress so that the next crisis can be more effectively coordinated. There was also much discussion on the impact the media had on the situation and how the constant barrage of news reports affected the region’s tourism industry. And social media wasn’t immune to criticism either. Interestingly, although there were many comments about the adverse impact of speculation and misinformation that were present in various social media channels, representatives from the US Coast Guard and NOAA were upbeat about its potential to help get information out to the public. Both the USCG and NOAA utilized the web to communicate important information throughout this event. 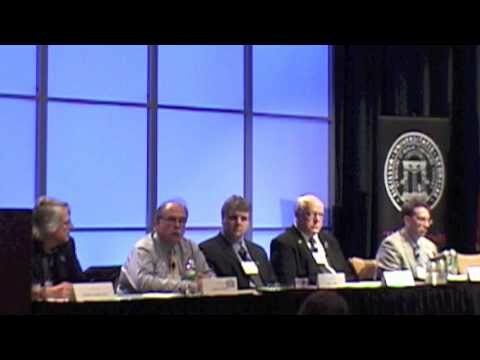 Click here for a short video where they describe how they used social media during the spill. More videos can be found on our YouTube channel, including a deeper look at the Scientific discussion and an interview with Dr. Samantha Joye. For my recap of Sylvia Earle’s Keynote speech on Tuesday 1.25.11, click here. I want to thank you for your continuous support for the communities on the gulf coast. The work and effort you have achieved is unbelievable. One reason you are able to reach goals as high as you have is because of your love for people and their spirits. You stay focused and are genuine about your research. You may get angry hearing the lies from gov. and agencies, but you keep your composure and focus. I am proud to work with you in anyway possible to get to the gulf oil disaster truths. I know it is going to get much worse before it get better. I’ve come to the point in this gulf oil warfare that if the government doesn’t protect us, and our country doesn’t come together to protect our environment, we may die. Look at the illnesses. Please don’t bring your families down here in the spring, summer. Just don’t. Don’t eat the seafood. FDA test are smell test and on the bases of a man 187lbs eating shrimp twice a week, oh and here is the best part. a safe portion with low chemical counts consist of 4, yes I say 4 shrimp! And they are headed, peeled and devained before they are tested! Pass this video and information. It is the gulf truth! Thank you for your very kind words, Lori. I feel privileged that I’m able to continue to provide support and information to people who have suffered so much throughout this tragedy. It’s important for others outside the Gulf to know that this issue has not gone away just because it’s not on the news every night. I will continue to keep these stories alive as long as there are people who will share and others who will listen. Ultimately, I believe that we all have to take a look at our own behavior and how our choices create a ripple effect throughout the system. These disasters and others like them will continue to happen until we come to grips with our crippling dependence on increasingly difficult to access fossil fuels. It starts with each of us making more conscious and informed choices in our daily lives. Thanks again for continuing to support the work we are doing. My heart goes out to you and your neighbors who deal with this every day. Thanx for the focus on the work that remains. As a participant in several forums, town hall meetings, workshops, etc., I am continually amazed that the “800 lb. gorilla in the room” dispersants & public health are rarely represented. These two issues are brought up by the public @ every single event yet no answers or followup continue after the meeting is over. While I am thrilled that funds have been allocated for environmental impact sutudies & that the NIEH will be conducting a long term study on 55,00 cleanup workers, what about the hundreds of thousands of gulf coast residents that have been here, breathing the air, swimming in the gulf & eating the seafood because they have been told it is safe. Where is their testing? I am not aware of a single penny that has been allocated for chemical contamination of blood for us. Why is that? Seems awfully stange to me! I understand about the 800 pound gorilla. It was definitely in the room last Wednesday. I was one of several audience members who asked questions about the dispersant testing and public health. The fascinating dynamic that we witnessed over and over again in our expedition back in August was that the fishermen in particular were totally confident in the safety of the water and the fish, but once the topic of dispersants came up, the energy in the conversation shifted immediately and an uncertainty about future impacts came out in their voices. We kept hearing that ‘nobody knows what’s going to happen.’ From Grand Isle to Portersville Bay, the reactions were almost identical. I wish I had a better answer on public health impacts. Like so many people, I don’t know what the ultimate fallout of this will be. Thanks for speaking up! I hope you will continue to participate in the discussion and help spread the word about our initiative. Thanks! I was thrilled with how the article turned out as well.